For e-gamers and operators, we present a gaming platform – BigBang. This platform indeed is one-stop-shop for gamers across the globe to make the most out of their online gaming experience. BigBang is an online gaming platform that provides gamers a medium for gambling and cryptocurrency token built on Blockchain technology to reward casino and eSport players. BigBang has a gaming ecosystem that provides gamers with a safe and secure system that rewards the players through a cross-service loyalty token – BigBang Token (BBT). This ecosystem benefits the users by incentivizing, improving all-in-all entertainment and gaming experience, reducing cost and by providing automated marketing for operators. Bounty Program will start at July 23rd 0:00 GMT time and will end on November 30th 23:59 GMT or when we reached the hardcap. Tokens are to be distributed 2 weeks after it ended. • Register your entries through our Google Forms located on each campaign and also post them on our Bitcointalk thread for your reference. • Daily or Weekly Reports for the entries needed to be submitted within each bounty week to qualify. • You can contact the Bounty Manager through the Bitcointalk thread and Bounty Telegram. Note: Just edit your post every time you add another entry. • Tokens will be awarded 2 weeks after the TGE ended. • We reserve the rights to cancel any of the campaigns base on the number of participants. • You are not practicing honest conduct or spamming forums. • We might need to refuse you from participating in any of our Bounty Campaigns regardless of reason. • You must take action reaching the Bounty Manager for any issues within bounty week or we will not take fault for stakes lost. • Spamming, cheating and having many accounts are strictly forbidden. We will completely remove you from all and any campaigns if found responsible under our management. 2. Those who joined the airdrop cannot participate on this campaign. 3. Bounty Hunters must be with the telegram community until the ICO ends to get the bounty. 4. The campaign will only accommodate a maximum of 12,000 participants. 5. We reserve the right to disqualify a participant if we find out that he/she was suspicious. 32k+ subscribers will get 500 stakes. 2. Bounty Hunter must have a Youtube channel only focusing on cryptocurrency to qualify. 3. Each bounty hunter is only entitled of 1 entry for this whole bounty campaign. 5. Video must not be under 4 minutes or else it would be marked as invalid. 6. We will accept videos of other languages as long as they are of good quality. 2. Bounty Hunters must at least have 100 comment karma to qualify on this campaign. 3. Bounty Hunters must submit each entry daily and hase at least 5 upvotes to be accepted. 4. 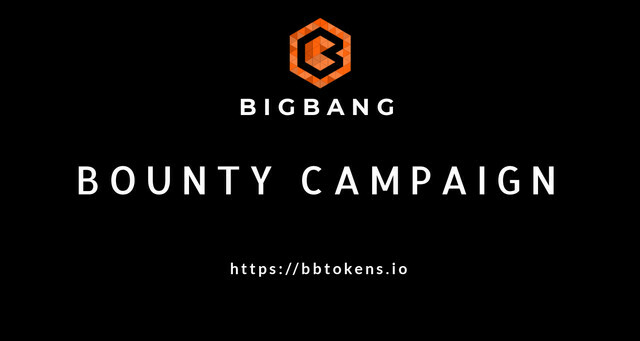 Bounty Hunters must at least make 3 reddit posts every bounty week with unique content related to BigBang. 6. Poor quality posts such as “Hello”, ”Good Luck”, “This project rules”, and other inadequate posts will not be considered as an entry for the bounty. 2. Bounty Hunters must share and like BBToken's posts. 3. Bounty Hunters must follow the Official Twitter Account of BBToken. 4. Bounty Hunters must have at least 1,000 followers to qualify for the campaign. 6. We will only allow 7 tweets and 7 RT&Like entries each account per bounty week. 7. Tasks must be made each day. 7. Tweet must include both @bbtokens and #bbtokens with unique content. 8. Retweet&Like must not be older than 2 weeks to qualify. 9. We reserve the rights to invalidate all of your entries even without any reason. 3. You must have a minimum of 1000 friends to qualify. 4. Bounty Hunters who duplicates entry will be disqualified unless you informed us if it was mistakenly posted. 5. We will only allow 7 entries each account in a daily basis per bounty week. Exceeded entries will not be counted. 6. We reserve the right to invalidate any of your entries even without reasons. 3. The article must be of high quality and proofread. 4. The article must ONLY be posted on Medium(https://medium.com/). 5. The content must be unique not just copy pasting from our ANN or Bounty content. 6. Participants are allowed to post any number of articles as long as the contents are unique for the whole Bounty Campaign. 7. In an event that we found out that you have copied or plagiarized an article, you will be restricted to join any of our campaigns. 8. The article must be published publicly otherwise it would be rejected. 10. The article should contain not less than 500 words. 11. The article must include links to our website, bitcointalk thread, official telegram channel and at least 3 of our social media accounts. 12. Eligibility of any article will be at our discretion, and we reserve the rights to reject any article even without reason. Comment per question on Bitcointalk thread you created: 20 BBT each reply related to the project of at least 100 characters. 2. Participants must translate the BBToken ANN thread, Bounty Thread, Whitepaper. 3. Text must be written and proofread by humans. Translations generated with the help of automation tools (e.g., Google Translate) will be disqualified and are ineligible to participate in the Campaign. 4. Participants must moderate and update their assigned thread(s) with BBToken news and updates to the BBToken ANN thread on a weekly basis during the Campaign Period. 5. All assigned translations must be completed within ten (10) calendar days of assignment; failure to complete the assigned translation may result in disqualification from the Campaign. 6. Translations are required for the following language: Russian, Filipino, Hindi, Arabic, German, French, Vietnamese, Chinese, Japanese, Korean, Spanish. There will only be one translator per language. I usually send message through telegram. Thanks for joining the bounty campaign.